At this time, everbody owned at least one account of some most popular Social Networks like Google+, Facebook, Twitter, Pinterest, LinkedIn, WordPress.com, Yahoo, Live, Vkontakte (ВКонтакте) … That’s why they won’t registe their new account of your WordPress website. The best solution to incease more communication with your audience but don’t require your separate membership are Enable Social Media oAuth login in WordPress. Social Media Login, also known as Social Sign-in, is a form of single sign-on using existing login information from a social networking service such as Facebook, Twitter or Google+ to sign into a third party website in lieu of creating a new login account specifically for that website. It is designed to simplify logins for end users as well as provide more and more reliable demographic information to web developers. Targeted Content – Websites can obtain a profile and social graph data in order to target personalized content to the user. This includes information such as name, email, hometown, interests, activities and friends. Multiple Identities – Users can log in to websites with multiple social identities allowing them to better control their online identity. Registration Data – Many websites use the profile data returned from social login instead of having users manually enter their Personally Identifiable Information into web forms. This can potentially speed up the registration or sign-up process. Pre-Validated Email – Identity providers who support email such as Google and Yahoo! can return the user’s email address to the 3rd party website preventing the user from supplying a fabricated email address during the registration process. Account linking – Because social login can be used for authentication, many websites allow legacy users to link pre-existing site account with their social login account without forcing re-registration. If you want to enable this feature by hand, it requires advanced programing knownledge, services API … My advise is Use WordPress plugin for simpler and easier solution, the hardest things has done by the author’s plugins. You’ll also be glad to know that all of these plugins are free to download, so feel free to try a few to see which suits you best. 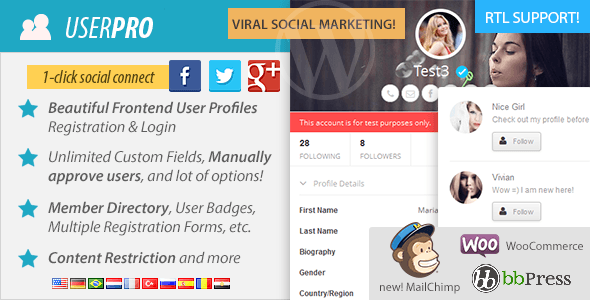 UserPro is a full featured user profile and community plugin for WordPress. It offers beautiful front-end profiles, login and registration for WordPress. UserPro is packed with so many features and control, It is more than just a user profiles plugin, with UserPro you can build your own community of searchable members directory, and give each user a customized, elegant profile – plus frontend, customized registration and login to your website. Your users will not know that you are using WordPress. This WordPress plugin isn’t free, its price is $28 but it’s worth to own with many pro features. It helps you increase your wordpress/buddypress user engagement in a few simple steps with the Social Login Plugin! You can make a login area on your website in order to do let your users to authorize their sign-in with social networks by purchasing and integrate to your website.No need regisration anymore! Using WordPress Social Login, your blog’s users will be able to login and comment with social networks such as Twitter, Facebook, Google and Yahoo. It also allows you to import users contact list from Google Gmail, Facebook, Windows Live and LinkedIn. Able to login and comment with social networks such as Twitter, Facebook, Google and Yahoo. Licenced under MIT License, WordPress Social Login available to everyone for completely free, with all features included, at absolutely no cost. Janrain social login increases site registrations and generates referral traffic to your site by allowing users to easily register and login via an existing social network or email ID. Janrain social sharing allows users to publish their comments or activities from your site to multiple social networks simultaneously. Give your visitors the option to sign-in to your site with their existing social network such as Facebook, Google, Twitter, Yahoo!, LinkedIn, Windows Live, MySpace, AOL and others (20+ Supported Networks). Provider selection viewable by admin in user list. Prompts users to enter an email address if the provider used for login does not pass a verified email address (WordPress Requirement). Expert option to collect placeholder emails to bypass this. If your user has an existing account with your site, Janrain Engage will map profile data received at login with the existing account (via verfiedEmail only). A customizable widget for your users to share your articles to multiple social networks simultaneously. Users can select up to four social communities such as Facebook, Twitter, LinkedIn and Yahoo for sharing. On average this will generate 13 referral clicks back to your site for each article that is shared. Each comment from a user signed in through a social provider gets an icon to the provider that links to their profile page for that provider. Users can connect a provider to their account through the profile page or the widget. They can also change the provider in the profile page. Register new users automatically when they want to share something from your site. This optional feature lowers the barrier for new user registration. Eliminate traditional registration form and let your users sign-up in few seconds with their existing IDs such as Facebook, Twitter, Google, Yahoo, Vkontakte and over 25 more. This will increase your sign-up rate up to 150% and you quickly build a loyal customer base! Let users share your web contents on over 90 social networks resulting into dramatic increase in referral traffic. Your users can now post comment with their social IDs. Option available to auto approve comments for social ID providers. Every time a user logs in, it fetches user profile data and store them in your WordPress database. These data and IP based data are used to present a unique social analytics to understand your userbase. Enable single sign-on in your WordPress multisite website. Our plugin support both domain-based and/or directory based features of multisite WordPress. Note: Social Sharing feature is available with LoginRadius FREE plan where as Social Login and Social Commenting features are available with paid plans. In last article, I’ve mentioned about the solution to Improve WordPress Comments System with Social Comments and in this article you see Social Media Login is another method to helps your audience can discuss about your topic. If you know of any other great solutions not mentioned in this article, please share them in the comments area below. Thanks for your reported, I’ve change it to display below the content and hide on the mobile to get better reading. HI, I am looking for a WordPress plugin that will allows users to post inside my wordpress when they create an account or login using their facebook or twitter accounts. Do you know a plugin that does this? I would also like it to automatically pull in their Twitter or facebook display image. Thanks for such useful information. I am using the Social Author plugin already and it’s awesome, however, the social login is the next step for which I needed idea. This one is really helpful in deciding which one should i go for! Yes I agree with you, I also find it helpful with this article. Many choices turned out. Hi, thanks for this very helpful article. I am creating a site where users will be able to post and vote on a topic (while logged in via a social site), but I want people who are not logged in to still be able to see vote results and peruse the site without having to be logged in. Can you recommend which of these options would work for that, if any? Thanks in advance. Social media is very popular billions of people are using facebook, instagram, twitter and other social networking websites, social networking websites can drive a lot of traffic. There are many other plugins also available. Can we fetch people’s google profile pics on comment thread? Most people who comment in my posts do not have gravatar profiles so whole comment section looks very empty kind of except my comment there (mostly my replies). Most of them use gmail accounts (because they fill gmail addresses while commenting, I can see it prior to approve their comments) so I got an idea to display their google+ profile pics on comment thread. Oh that’s nice work, Its awesome stuff for my personal blogs through i can easily manage my social bookmark accounts. You gave my required stuff so thanks for it dear admin.